"Jerusalem, Jerusalem! You kill the prophets, you stone the messengers God has sent you! How many times I wanted to put my arms around all your people, just as a hen gathers her chicks under her wings, but you would not let me!" Already in Grade 3 Jack had a soft spot for Sandy. It wasn’t cool for the boys in Grade 3 to include girls in their circle of friends but secretly Jack thought Sandy was truly someone special. Of course, he always denied it vigorously when his mates ‘accused’ him of having a girlfriend. It wasn’t until Grade 7 that Sandy and Jack became best friends. She called him "Flathead" because his head was kind of flat on the top. He hated being called that but because he had a crush on her, he didn't mind. They swapped photos and Jack kept his photo of Sandy in his newly acquired wallet and when he was by himself he would take it out and simply stare at it. That picture of Sandy was his most prized possession. As the year progressed finally Jack got the courage to ask Sandy to be his girlfriend. She laughed and said, "Yuck, Flathead! You’re like my brother! Besides I love Mark." Ouch, that hurt! He had never felt pain like this before. His heart was good and broken for the first time. He kept her picture in his wallet for quite a while after this hoping that one day she would see how much he loved her but it didn’t happen. Many years later he bumped into Sandy again at a school reunion. His heart still warmed at seeing her and for a moment imagined her running into his arms and saying, "O Jack, the biggest mistake in my life was not becoming your girlfriend". That thought instantly dissolved as Sandy said, "Flathead! Wow! Where’s your hair gone!" Rejected love is ever so painful! Whether it’s a wife whose husband has left her for a younger woman or a child whose dad doesn’t live at home anymore and says to his mother, "Why doesn’t daddy want to do things with me anymore", the pain of rejected love is one of the worst feelings. It hurts when someone rejects your love, whether you are 3, 13, 33 or 73 years old. In the reading from Luke’s gospel today, we witness the pain of rejected love in Jesus’ heart. Jesus isn’t only talking about the people of his time rejecting the love he has for them but he is also recalling the long history of people rejecting the love of God. From the first chapters of the Bible we see how much God is affected by the constant rejection of his love for the people he created. With the deep love of a father he reached out to Adam and Eve as he searched for them in the garden and wanted so much to put his arms around them. Instead they hid from him. In love he sent messengers, prophets, even angels to tell his people how much he loved them. Each had the same message, "Turn your hearts back to God because he loves you, he wants to protect and help you and wants you to be with him." Again and again each messenger was rejected. And the rejection wasn’t just of the messenger, but of the One who sent the messenger. And the more God spoke, the more people turned a deaf ear. Jesus expresses the broken heart of God as he says, "Jerusalem, Jerusalem! You kill the prophets, you stone the messengers God has sent you! How many times I wanted to put my arms around all your people,… but you would not let me". Can you sense something of the pain that God must feel in his heart? Like parents who constantly reach out and try to express how much they love their child – guiding, warning, advising, caring, loving, showing understanding and demonstrating the kind of love that only a parent can have for a child and yet their love is constantly rejected. The parents grieve as their child ends up in all kinds of trouble simply because the guidance offered in love has been ignored. His children may have rejected his love in the past but that doesn't stop God from continuing to love his creation. And that leads him to do the unthinkable. He does what is so risky and dangerous. God sends his Son, the ultimate gift of love to once again show his rebellious children how much he loves them. But he too, like the prophets of old, is rejected, ridiculed, beaten and nailed to cross to die, left to die by even those who were the closest to him. The greater the love, the greater the pain of the rejection. The Bible says that the greatest love a person can have is the kind that is willing to die for his friends (John 15:13). We are told that God’s love for the world is so great that he sent his only Son to rescue his people from death and give them eternal life (John 3:16). Paul writes, "God has shown us how much he loves us—it was while we were still sinners that Christ died for us!" (Romans 5:8). The love that God has for us is immeasurable, and greater than any love we could imagine. So, with such great love as this, imagine the pain within the heart of God when his people refuse him. We feel the pain in Jesus’ words, "Jerusalem, Jerusalem! … How many times I wanted to put my arms around all your people, just as a hen gathers her chicks under her wings, but you would not let me!" In his expression of his pain, Jesus uses the picture of a hen and her chickens. Hens are great mothers for their chicks. When you see a hen with chicks you will always hear her clucking. Apparently the chicks recognise the clucking of their mother and so are secure in the knowledge that their mother is not far away. When the hen finds something to eat her clucking calls them to come to her. When there is danger nearby or the weather turns dangerously cold for the chicks, there is security and warmth under her wings. God is never far away and we can feel safe knowing that his love and power are close by even in the middle of most difficult times. He is always calling us to come closer, to feel the warmth of his love, to follow a way of life that is healthy and safe, to be the people he intended us to be. His protection from all that would harm us is certain; we are even protected from the effects of sin and death in our lives. Even when we are at our lowest, we know that we can endure all things through the strength that comes only from him. Psalm 91 reads, "He (God) will cover you with his wings; you will be safe in his care; his faithfulness will protect and defend you" (v 4). 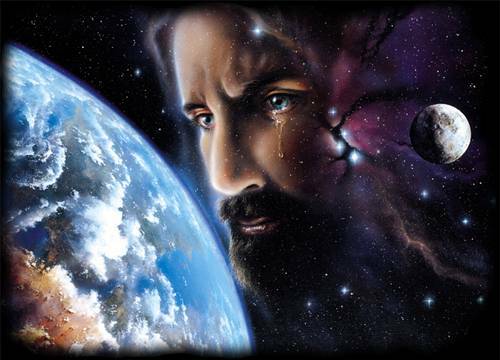 Jesus weeps because of the pain he feels in his heart. God has offered so much. The Old Testament stories are proof of his love. He has cared for and watched over his people all these centuries and now out of love he has sent his only Son but what has been the response - rejection. God is saying, "I love you so much; I want to help you; I want to put my arms around you and keep you safe; I want to do so much for you and you will not let me". The love this mother had for her son is the same love that God has for you and me. No matter how bad we’ve been, no matter how unfaithful we’ve been, no matter how low we go... God still loves. We are still his children as rebellious and hard to get on with we might be. He still keeps each of us in his heart and longs for the day when his children will see just how much he loves each of them. We are now in the season of Lent and today we are urged to take a long look at our relationship with God. We take a fresh long look at just how much God loves us and keeps on loving us even though we disappoint him so often. He has sent us his Son and messengers through the read and spoken Word from the Bible and yet we find ourselves still acting as if God's love didn’t count at all. I wonder how often Jesus says about us, "I want to put my arms around you and you won’t let me". I wonder how often Jesus weeps when he sees us hurting, struggling, carrying enormous burdens, all the while forgetting that he is close by like a mother hen ready to carry our burdens for us because he loves us so much. What do we do? We don’t want to let go. We want to be in control. We want to work things out for ourselves. It must really hurt God to see us struggle in this way when there is so much he can give to help us. I wonder how often Jesus must weep over us when he sees us clinging on to those sins that we know all too well are not what God wants. There are those temptations and habits that are so hard to let go and we really struggle with them. In the end, we feel so guilty because once again we have said cruel words and done unkind things. As Jesus sees us struggle with our sin he must say, "If only you would trust me and let me put my arms around you things would be so different." I wonder how often Jesus weeps over his church as much as he wept over the people of Israel when he sees how wrong we get things in the church. We get things so out of focus that we no longer see that God and his love for us and for all people as central. We argue, put others down, want our own way, don’t care about the feelings of others, forgetting that we are ‘citizens of heaven’, to use Paul’s words in the Philippians reading. As Jesus observes his church he must say, "I want to put my arms around you and guide with my Holy Spirit, but you won’t let me". Jesus is saddened by the rejection of God's love for his people because this rejection leads to the judgement of God on those who refuse his love. But there is also hope, a promise, in Jesus’ words. Like a caring mother hen he keeps on calling us, gathering us close to him, sheltering us under his protective care, ensuring that we have the strength to deal with whatever comes our way because his love for us goes on forever. Today Jesus invites us to trust him, know his love and urges us to run under his wings for safety and warmth. Whatever we are facing in our lives at this moment he invites us to allow him to put his arms around us.